The Frederick Douglass Square Marketplace began on May 30, 2009. Local farmers, community members, and organizations set up booths on several Saturdays throughout the summer of 2009. Bobby Walker’s produce stand was the major vendor throughout the summer. In 2010, AVAW hopes to assist in the further development of the marketplace. Permits for additonal vendors have been secured. The second Saturday of each month will feature live music and Bobby’s famous BBQ! 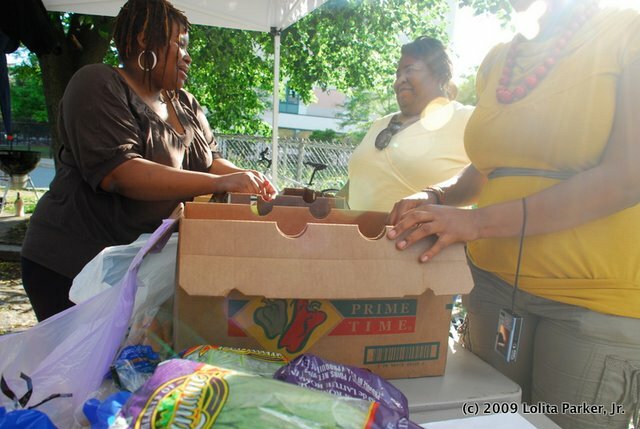 Starting on June 5, 2010, there will be local plants, produce, crafts, and community vendors at the end of Cabot Street in Roxbury every Saturday. A Village at Work is diligently working to recruit vendors and spread the word about this wonderful community cultural event. The market will continue to provide a social space for community members to interact and get healthy fresh food right in the neighborhood.